Alright ladies, take a deep breath and say it with me: Donald Trump is president-elect of the United States of America. How’d that feel? A little dirty? A bit like a rhinoceros accidentally stepped on your trachea? Do you find yourself suddenly empathizing with everything Truman Burbank had to go through when he realized his entire life was just one giant lie manufactured by elite powers beyond his control? Yeah, me too. That's why now is the time to turn to feminist activists and authors for inspiration and motivation. 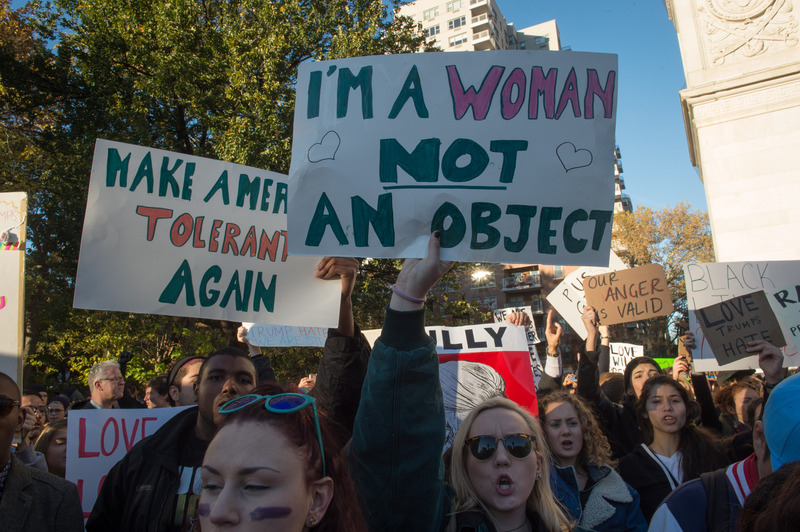 For most of us active feminists and modern feminist activists, last Tuesday when we suddenly found ourselves unwillingly shoved into Trumplandia, a night of shock was followed by a day of tears, which — for some of us — was followed by another day of tears, perhaps with some protesting thrown in for good measure. People all over the news and social media called for hope, for patience, and for enduring faith in the human spirit — and don’t get me wrong, that’s all lovely. But it’s been a week, we’ve had sufficient time to make our way through the stages of grief, and now it’s time to take some real action: whatever that might look like for you. Join a protest, donate to Planned Parenthood, reach out to your friends and family of color and see how they’re feeling, volunteer with an immigrant rights organization, have a mindful and informed conversation with someone who voted differently than you — just get out there and start working for the world you thought you were getting on election night. Upholding the American tradition of a peaceful transfer of power doesn’t mean we have to allow a complacent transfer of power. Autocracies are enabled by the people living beneath them. Is it easier to just go about your daily life, cautiously avoiding eye-contact with that couple across the street whose Ford F-150 Raptor makes you wonder whether or not they’d challenge your right to an abortion, and keeping your fingers crossed for 2020? Sure. But that’s exactly how dictators like Adolf Hitler, and Kim Jong-un, and our new president-elect’s personal hero Vladimir Putin rise to power and stay there. It’s time to point our collective fingers at the president-elect and say: oh, by the way, all that junk you spewed about your inherent right to disrespect my body, revoke my reproductive rights, deport people I love, and religiously-profile nearly 1% of the American population, thereby unleashing a wave of bigotry, misogyny, sexism, racism, and homophobia across this country — that's not going to fly anymore. In my own life, I became a writer, a feminist, and an activist because of the women who came before me — the feminist activists who raged against authority and the feminist authors who knew the power of words to inform people’s hearts, minds, and actions; something our current president-elect clearly has yet to grasp. Read their words, find your own inspiration, get out there, and fight. Here are 20 feminist authors who will inspire you to get started. Naomi Klein is a Canadian author and social activist (her parents moved from the United States to Montreal in 1967 as part of the Vietnam War resistance) who has dedicated her life to fighting against corporate globalization and capitalism, and the ways corporate capitalism has led to climate change. She is best known for her books The Shock Doctrine: The Rise of Disaster Capitalism and more recently This Changes Everything: Capitalism vs. the Climate. A Pakistani author and activist for female education, Malala Yousafzai began her writing career as a pseudonymous blogger for the BBC, for whom she wrote about her experiences living under the repressive Taliban occupation. When her identity became known, the Taliban shot her on her school bus, an attack that she survived, and that led to international recognition. Yousafzai is the youngest-ever winner of the Nobel Peace Prize, and her memoir is I Am Malala: The Story of the Girl Who Stood Up for Education and was Shot by the Taliban. Angela Y. Davis began her activist career in the Civil Rights Movement and as a leader of the Communist Party USA, committed to fighting against racism and the prison industrial complex. Her most recent work of activist literature is the 2016 title Freedom Is a Constant Struggle: Ferguson, Palestine, and the Foundations of a Movement. She also edited the collection of resistance essays If They Come in the Morning , which has appeared on a number of banned books lists since it was first published in 1971. Kate Millett is an American feminist, activist, and writer who is known for her influence on second-wave feminism — a feminist movement that began in the 1960s and focused on issues of domestic violence and sexual assault. Millet has written a number of books in defense of feminism, her most well-known being Sexual Politics , which looks at the myriad (often unrealized) ways patriarchal norms infiltrate daily life, from literature and politics, to psychology and domestic life. Dorothy Day was an American journalist and social activist who co-founded the nonviolent civil disobedience group the Catholic Worker Movement, and dedicated her life to equal rights and providing necessary direct aid to the homeless and those living in poverty. As an activist she was intensely critical of political policies that led to war and that promoted racism, sexism, and economic inequality, and today she is considered the most famous political radical in American Catholic Church history. Day wrote a number of books about social activism, including House of Hospitality, From Union Square to Rome and Loaves and Fishes: The Inspiring Story of the Catholic Worker Movement . Her memoir is The Long Loneliness: The Autobiography of the Legendary Catholic Social Activist . Credited with being an early activist in the global environmental movement, Rachel Carson was an American marine biologist and conservationist, who is best known for her work fighting against the use of synthetic pesticides. After writing her 1962 title Silent Spring , which focused on the environmental damage caused by pesticides, the use of the pesticide DDT was banned across the United States, and a grassroots environmental movement was founded, which ultimately led to the creation of the Environmental Protection Agency. Gloria Steinem has spent her life rallying for feminism and social and political justice. She was a leader and spokeswoman for the second-wave feminist movement of the 1960s, '70s, and '80s, also founding the feminist magazine Ms. and co-founded the Women's Media Center, which works for gender equality in the mainstream media. Her most recent book is My Life on the Road , a memoir about Steinem’s life as a feminist organizer, activist, and writer. Founder of the Defenders of Human Rights Center in Iran and Noble Peace Prize winner for her work in bringing democracy Iran and defending y women's, children's, and refugee rights, Shirin Ebadi an Iranian lawyer and human rights activist. She is the only person to ever have her Nobel Prize seized by the government — her award was denied her by Iranian authorities in 2009, and she has been living in political exile in the United Kingdom due to her resistance work against the current Iranian regime. Her best-known books include the 2016 memoir Until We Are Free: My Fight for Human Rights in Iran and the 2006 memoir Iran Awakening: A Memoir of Revolution and Hope. Sheryl WuDunn is a writer, Pulitzer Prize winner, and business executive who focuses on issues of alternative energy, and women entrepreneurship. In 2009 she co-authored the book Half the Sky: Turning Oppression into Opportunity for Women Worldwide with her husband, the journalist Nicholas D. Kristof. The Pulitzer Prize-winning book digs deep into the lives of ordinary women across Africa and Asia who have made extraordinary economic, social, and political transformations in their lives and the lives of women in their communities. Lillian Hellman was an American playwright who became known for her political resistance when she was blacklisted by the House Committee on Un-American Activities during the anti-Communist paranoia of the late 1940s and early 1950s, and was known for her critique of America’s pre-World War II appeasement of Adolf Hitler, as well as her stance against American’s who were complacent in CIA spying on American citizens, the Vietnam War, and the Watergate scandal. Considered one of the most well-known African American poets in the world, Nikki Giovanni is a writer, spoken word artist, and activist who began her career as part of the Black Arts Movement, and often uses her writing to explore issues of racial and social inequality, and gender dynamics within the African American community. She has credited both the Civil Rights Movement and modern hip hop with inspiring her poetry. Rigoberta Menchú Tum is a Guatemalan political activist who has spent her life defending indigenous peoples’ rights, and specifically speaking and writing openly about the rights of Guatemala’s indigenous feminists, in addition to campaigning against the human rights violations committed by the armed forces during Guatemala’s civil war. She currently works as a UNESCO Goodwill Ambassador is a winner of the Nobel Peace Prize for her work forging peaceful relations between Guatemala’s indigenous people and the larger government establishment. Her memoir is I, Rigoberta Menchú . If you loved the 2014 feminist take on the infuriating gender dynamics that exist between men and women, Men Explain Things to Me , then you’re already familiar with Rebecca Solnit. (The author also gave away a free e-book on hope in the days after Donald Trump’s astonishing and heartbreaking Electoral College victory.) But what you might not know about Solnit is that she has been an environmental, human rights, women’s rights, and antiwar activist for decades. Her book Savage Dreams: A Journey into the Landscape Wars of the American West , details some of that activism. Anne Waldman is a cultural and political activist, a post-Beat writer and performance poet who helped Allen Ginsberg found the Jack Kerouac School of Disembodied Poetics, a lifelong student of Buddhism, and a member of the Outrider experimental poetry community. As a writer and as a feminist, Waldman has always been known for pushing the boundaries of what poetry can do. Fast Speaking Woman is an energetic and vivid collection of poetry that blends feminism and mysticism, religion and ritual, and celebrates chanting as the ultimate form of poetry and performance. Manasi Pradhan is an Indian activist, author, the founder of the anti-violence against women campaign: Honor for Women National Campaign, and an activist that defends educational opportunities for girls and women across India, in order to encourage them to become future leaders of their communities. As a child and teenager Pradhan was urged to end her education after middle school, when most Indian women did, but she continued to pursue her education through two Bachelors and one Masters degree. Pradhan also works as an author and poet, whose work has been translated into more than eight languages around the world. Former director of the Racial Justice Project at the ACLU and civil rights activist Michelle Alexander has dedicated her career to speaking out against discrimination and racial profiling by law enforcement, and worked as a litigator in class action lawsuits against race and gender discrimination. She has also spoken out against the prison industrial complex, and is an advocate for criminal justice reform. Her book, The New Jim Crow , takes readers behind the nameless, faceless statistics of the men who live behind the bars of American’s prison system, demonstrating that communities of color — and black men in particular — are specifically targeted for arrest and incarceration. Winona LaDuke has dedicated her life to the reclamation of tribal lands by North America’s indigenous peoples, as well as working to support environmental preservation and sustainable development. She is a writer, an environmentalist, and an economist who has written extensively about her advocacy of indigenous rights and the environment, and who once ran for vice president of the United States as the Green Party nominee. Her activist books include All Our Relations: Native Struggles for Land and Life , The Militarization of Indian Country , Conquest: Sexual Violence and American Indian Genocide , and Grassroots: A Field Guide for Feminist Activism . Betty Friedan is one of the most widely-recognized feminists in American history, and dedicated her life to feminism and activism. She co-founded the National Organization for Women and organized the nationwide Women's Strike for Equality in 1970. Her writing career took off after her article about housewives who were desperate for more meaning, adventure, and independence in their lives was refused publication by mainstream media, and she turned it into a book instead. That book is the feminist classic, The Feminine Mystique , which is credited with inspiring the second-wave feminist movement, and chronicles the lives of several 1950s housewives, and their dissatisfaction with the domesticity of their lives. Claudia Rankine is an activist, poet, and essayist who was recently awarded a MacArthur “Genius Grant”, with which she as stated plans to found what she calls a “Racial Imaginary Institute” — a space for writers and artists to gather over projects that work to dismantle racism and change the ingrained narratives of people of color in the United States. Nominated for the National Book Award in Poetry in 2014, Claudia Rankine's Citizen: An American Lyric catalogues the instances of racism — intentional or otherwise — that occur every day, and details the affects that racism has on minority communities and the United States as a whole. Ann Jones has dedicated her journalistic career to focusing on humanitarian and women’s rights issues in the United States and around the world. She has focused her writing on issues of war, domestic violence, and the oppression of women. From 2007 to 2009, Jones traveled through Africa, East Asia, and the Middle East, giving women digital cameras in order to document how war has changed their lives. Her book, War is Not Over When It’s Over , is the expansion of that photographic project: an intimate account of the long-term physical and emotional wounds of warfare, cultural destruction, and the geographic displacement of women who have spent their lives living in war zones.